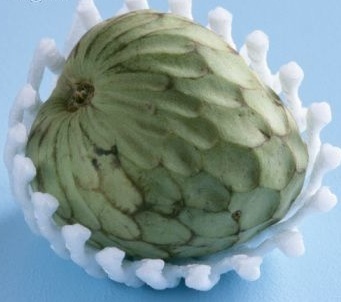 Not sure where to start, I found a Peruvian recipe for a meringue cake using chirimoyas. I was worried that the combination of sugary meringue, manjarblanco (also known as dulce de leche) and sweetened cream would be too much. 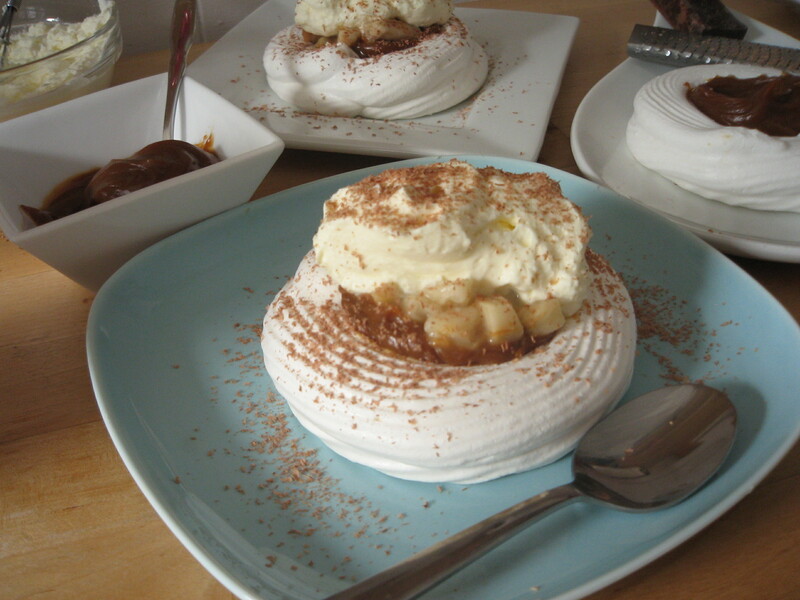 I decided to shape the layers of meringue into smaller pavlovas to make individual desserts. Believed to have originated in New Zealand and named after the Russian ballerina Anna Pavlova, it was a fitting choice. After the whipping and whirring of the meringue, the crisp exterior of the meringues gave way to a mashmallowy center that mixed well with the manjarblanco. Meanwhile, the chopped chirimoya balanced out the sweetness like a dancer who spins and flies then lands perfectly on point as though it couldn’t have ended any other way. It was too much but just enough. Adapted and translated from Yanuq from their recipe for merengado de chirimoya. Though there are several steps, the pavlovas can be made well in advance and assembled just before serving. Why the grated chocolate didn’t drive it all over the edge, however, I can’t explain. I just know it worked. Line a baking sheet with parchment paper. Using a small bottle or cup, trace 6 circles on the parchment paper, about 3″ each. Turn paper face down on the baking sheet and set aside. In a stand mixer fitted with the whisk attachment, beat the egg whites with a pinch of salt on medium-high until frothy. Combine the sugar, baking powder, and potato starch. Gradually add the sugar mixture and continue to beat until it forms stiff peaks. Fill a pastry bag fitted with a star tip with the meringue. Pipe a disc of meringue to fill each circle on the prepared sheet then an a additional layer along outer circle to form a border. 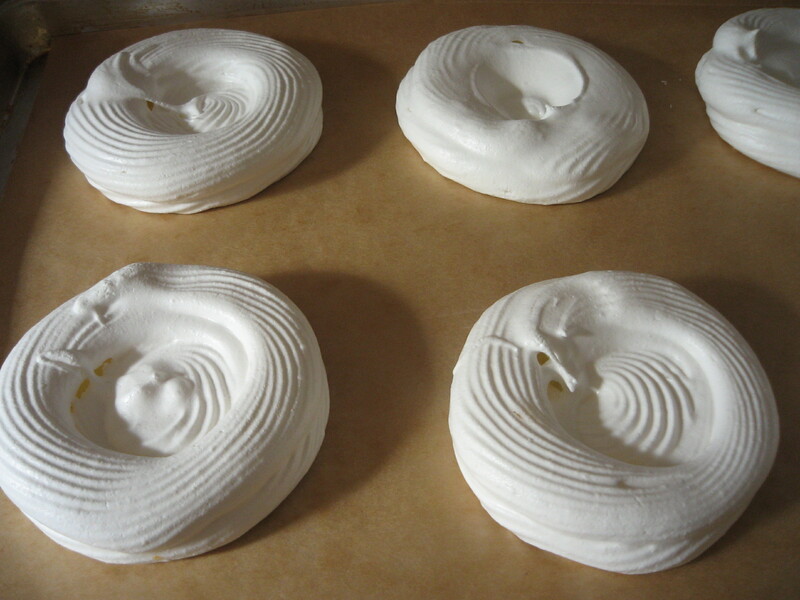 Place the meringues in the preheated oven and immediately lower heat to 190 degrees. Bake for two hours occasionally rotating pans. Remove from oven and cool on a rack. While the meringues cool, beat the heavy cream until slightly thickened. Gradually add the powdered sugar and continue to beat until soft peaks form. To serve, place one meringue on dessert plate. Add about one tablespoon of manjarblanco to the center of each meringue and top with a round tablespoon of chopped chirimoya and cover with whipped cream. If using, garnish with grated chocolate. wow. these are gorgeous. well done. That sounds incredible! I will definitely try it the next time I find chirimoyas! Potato flour? I’ve used cornstarch (maicena) which is a standard in many Peruvian recipes. The individual portions sounds great to me, no matter how careful you are, the big meringues are crumbly, and harder to serve; making them in portions is practical as well as pretty.